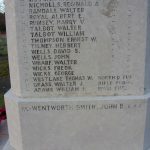 Immediately after the conclusion of the First World War Brandon discussed its own memorial to those men from the town whom had been killed. 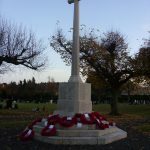 In January 1919 a committee, created to discuss what form the memorial should take, discussed their disappointment that they had not been offered a decent war trophy to display in the town. 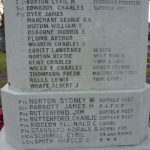 Perhaps a captured German machine gun or mortar would be befitting of a town who had done so much for the war effort, especially as one of its own, Walter Norton, had been involved in the first ever capture of an enemy tank by the British Army. One committee member suggested that the machine gun could be mounted on a plinth on the Market Hill to serve as the memorial. Some supported a similar view that a memorial, minus the machine gun, should be erected on the Market Hill and be surrounded by a small chain fence. Others liked a stained glass window or a brass tablet in the church, or even the building of a cottage hospital, whilst the Rev Mensink, from the Baptist Church, remarked that some people he had spoken to wanted a memorial erected in the Cemetery because this was a place that belonged to the people and it would be taken care of and be seen by every person visiting the Cemetery. The committee chairman at the time, Colonel Hamilton, who lived at Brandon House, agreed but the talking continued. Toward the end of the war a new arrival had moved into Brandon Hall. General de Lotbiniere, as a way of commemorating the end of the war, offered a piece of land to the town for use as a recreation facility and in 1919 he helped to form the Recreation Club which saw sports such as tennis and hockey come to the town to complement already established sports such as football and cricket. This was a gesture he repeated after the end of the Second World War when he gave the town some land to create the Remembrance Playing Field. 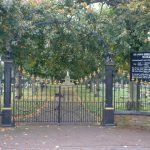 By the summer of 1919 the townspeople had donated more than £240 in cash to get the building started on the memorial and the committee finally decided that it should be erected in the cemetery. The war returned briefly to the town when, in July of 1919, peace terms were finally signed and the war was officially declared finished. More than 1,000 towns people joined a procession led by the demobilised men and Sunday school children, marching to a band then went from the Market Hill down to the Railway Meadow for afternoon entertainments and tea. However a heavy shower of rain stopped the proceedings going into the evening, but not before a bonfire got lit on Broom Hill. A year after the Armistice Brandon got its war trophy and it was ‘Houseman and Relhan’, a clothing store on the High Street, who first displayed the captured German machine gun, which brought a lot of interest from the town. The irony is that it was this shop, who at the start of the war, had to place advertisements in the local paper declaring that they were British through and through and for local people not to listen to gossip stating otherwise. 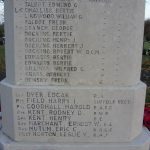 In 1920 the town was still without its war memorial, while other towns in the region were already remembering their dead with theirs, and with Brandon lagging behind its residents were not happy. St Peter’s Church had unveiled its own memorial, in the form of a bronze tablet, during May 1920, and then declared it had enough funds left over to erect a memorial stained glass window. Now the local branch of the National Federation of Discharged and Demobilised Sailors and Soldiers took an interest and wanted action. If the Brandon War Memorial Committee could not sort itself out with a fitting memorial then it would take matters into its own hands. The union wanted a memorial on the Market Hill, protected with metal railings, because it was a public place. This idea had worked in other local towns. 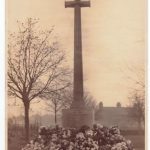 This then caused a reaction amongst some townspeople who reinforced their view that the memorial should be in the cemetery and there was a flurry of activity and building work commenced, resulting in the unveiling of the memorial on Sunday 17th October 1920. 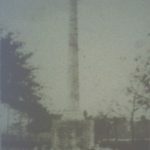 Colonel Spragge, standing in for Colonel Hamilton who had left the town and could not return that day due to the weather and industrial strikes that had crippled the transport, then stepped forward to unveil the monument. 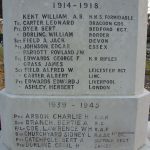 Colonel Spragge pulled away the flag to reveal the monument – a large stone cross embellished with a Crusader’s sword on one side and the names of the men who had been killed written into the plinth. He said he had lived in Brandon for at least twenty years and, although he had since left to live elsewhere, he felt he knew the town very well. The men who were named were gone but their memory would live on and they had died for the freedom of the world. He said, speaking as an old soldier, there could be no more glorious death than to die in the field as these men had done. Next followed hymns, a dedication, the ‘Last Post’ sounded by a couple of buglers and prayers, before the monument was blessed and the ceremony brought to a close by the buglers playing the ‘Reveille’. The dead men’s friends and family then laid a large number of floral tributes on the memorial and one huge one of white flowers from Brandon’s Fire Brigade especially stood out. It was, by all accounts, a very moving and emotional day for the town. Through all my research of the war and its effects in Brandon I have read much and perhaps the most poignant words come from Mr Harry Patch, the longest surviving British soldier from the First World War, although not a resident of Brandon. In fact he has no links to Brandon, but what he says in a couple of sentences sums everything up about the war. Before he died, aged 111, he appeared on many televisions programmes and his thoughts of the war are well documented. I will let him have the last word.